First is Haiti. Ahead of almost all nations, to deal with the devastation of a hurricane that destroyed parts of Haiti, Israel sent scores of doctors and other professionals. Years of dealing with terrorist attacks combined with an advanced medical technology sector have made Israel one of the most nimble countries in disaster relief. By contrast, the absence of rich and powerful Persian Gulf nations in the relief effort has been glaringly conspicuous. The technology that Israel has utilized in Haiti is far beyond almost all nations who have sent aid. Israel seeks to be a blessing to the world?and its response in Haiti is a powerful illustration of that conviction. Second, consider these statistics. There are about 18 million Jews worldwide?0.2% of the world?s population. But Jews make up 54% of the world chess champions, 27% of the Nobel physics laureates and 31% of the medicine laureates. Within the United States, Jews make up but 2% of the US population, but 21% of the Ivy League student bodies, 26% of the Kennedy Center honorees, 37% of the Academy Award-winning directors, 38% of those on a recent Business Week list of philanthropists, and 51% of the Pulitzer Prize winners for nonfiction. Within the nation state of Israel itself, Tel Aviv has become one of the world?s foremost entrepreneurial centers?a new silicon valley in fact. For example, Intel is the largest private-sector employer in Israel, with more than 8,000 employees, four design centers and two manufacturing plants. The Israelis who manage the R&D centers are responsible for much of the microprocessor innovation over the past 20 years, developing chips for large desktop computers, laptops, tablets and smartphones. Columnist David Brooks writes that ?Israel has more high-tech start-ups per capita than any other nation on earth, by far. It leads the world in civilian research-and-development spending per capita. It ranks second behind the US in the number of companies listed on the NASDAQ. Israel, with 7 million people, attracts as much venture capital as France and Germany combined.? Israel has used the present financial crisis in the world to solidify the economy?s long-term future by investing in research and development and infrastructure, raising some consumption taxes, promising to cut other taxes in the medium to long term. The financial giant Barclay?s argues that Israel is ?the strongest recovery story in Europe, the Middle East and Africa.? Finally, the nation of Israel is nothing short of astounding in terms of its creativity, scientific genius and technological savvy. For example, between 1980 and 2000, Egyptians registered 77 patents in the US. Saudis registered 171. Israel registered 7,652 patents!! The current Prime Minister, Benjamin Netanyahu, argues that Israel will become the Hong Kong of the Middle East, with its economic benefits spilling over into the Arab world. There is indeed some evidence that this is already occurring in Jordan and in the West Bank. An astonishing example of this innovation is the Israeli company Netafim, a company that produced the world?s first drip irrigation system, which consists of a series of plastic pipes with small holes that lie on the ground. This system revolutionized the way Israel made its desert bloom so that it became a leading supplier of fruits, vegetables and flowers to the European market. Today, Netafim is the number one provider of drip irrigation to the world and conducts business in 110 countries spanning five continents. This highly efficient system has helped nations produce 50% more crop yield while using 40% less water. Nations such as India, Vietnam and Philippines all benefit from this technology. However, nations such as Iran and its terrorist allies, Hezbollah and Hamas, despise the success and innovation of Israel and seek to destroy it. Israel is one of the smallest nations on earth, but its contributions to humanity are astonishing. Why is this so? There are many possible answers. But permit me to offer a theological one. 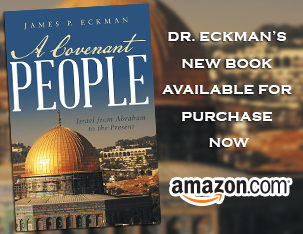 God said to Abraham that in and through his descendants, the nations would be blessed. We are seeing that occurring before our very eyes. Further, God declared forthrightly in Ezekiel 36 and 37 that He would one day bring the Jewish people back to their homeland. We are seeing that very miracle occurring before our eyes. Finally, God said that He would ?bless those who bless you [the Jews] and curse those who curse you [the Jews].? [A modern example of this truth: Unlike virtually all other nations on earth, the United States has opened its arms to the Jewish people and has been its strongest advocate and supporter since 1948. Indeed, the US was the first nation to recognize the legitimacy of the State of Israel in 1948. Without question, had the US not given this level of support to Israel, Israel would have been annihilated. Is that one of the reasons God has chosen to bless the United States? If Genesis 12:3 is true, the answer can only be yes.] The Jewish people are indeed a miracle. The Jewish people have suffered phenomenal persecution over the last 4,000 years and yet it has not caused their extermination or annihilation. They have endured, as God said they would. They are now coming back to their land and are indeed blessing all nations. The fundamental blessing of course has come through Jesus, the Messiah; the blessing of justification by faith is available to all. In Romans 11:25-26, the Apostle Paul declared that when the ?fullness of the Gentiles has come in . . . all of Israel will be saved.? The argument Paul is clearly making in all of Romans 9-11 is that we Gentiles should be thankful to God for the Jewish people because blessing has come through them, principally of course in the Lord Jesus. And, because of God?s grace, we Gentiles by faith are grafted into ?the olive tree of blessing? ?God?s covenant promises. God is not finished with the Jewish people. His plan and His redemptive purposes for them will be accomplished. What is occurring in the Middle East today is supernatural. God is making Israel a blessing to the nations. But, as the Bible makes clear, the nations will turn on Israel and that will begin a chain of events that will ultimately produce the return of Jesus Christ. So, we can only proclaim as did the early church–come quickly Lord Jesus! What God is doing through Israel is astounding! I’m paying attention. Thanks for sharing it. Thanks for the inspiration, based on fact. Jews are STILL God’s chosen and FOREVER will be. I pray for the pece of jerusalem, and desire to see my nation India draw closer to Israel and be a blessing too to the earth. shalom. And bless them with peace.? Through Messiah Y’shua the Prince of Peace – Amen. From the standpoint of the Gospel they are enemies for your sake, but from the standpoint of God?s choice they are beloved for the sake of the fathers; for the gifts and the calling of God are irrevocable. In the same way then, there has also come to be at the present time a remnant [of believing Jews] according to God?s gracious choice …. I praise God for isreal. He is showing his glory through that great nation. I really wish I had enough money to visit isreal. Thank you for this valuable information. The Bible is accurate in all of its prophetic Declarations. Best info I ve found on Israel.Thank you. Log in | 36 queries. 0.103 seconds.